The Crookes radiometer is a very neat scientific toy. 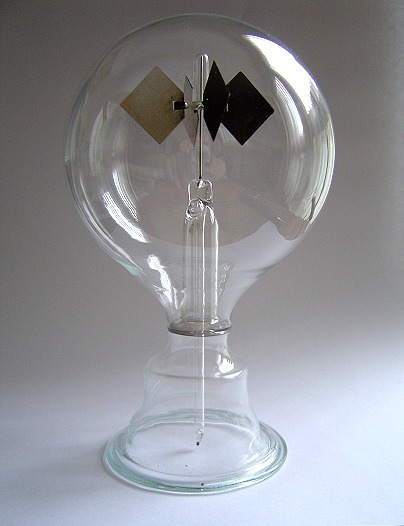 The paddles inside the glass bulb move when the radiometer is exposed to light. This toy has a series of paddles inside a glass bulb. The paddles are not connected to any motive power, and there is no motor or solar cells involved. Yet those paddles go around and around, seemingly for ever. It looks like perpetual motion, but really it is being powered by the Sun - or whatever light source is nearby. The glass bulb may prevent mechanical energy being used to turn the paddles, but it doesn't stop light, and in this form, energy is constantly streaming into the device. Thanks to www.gyroscope.com for permission to use their video. Buy a copy of The Universe Inside You or its companion Inflight Science. See a video based on the book. Recommended books to find out more about the subjects covered. What are they saying about The Universe Inside You?